For many, December marks the start of the holiday season. But the holidays don’t represent a season of joy for everyone. According to a report from the American Psychological Association, 38 percent of people report that their stress increases around the holidays. And the high volume of parties around the holidays can make this a particularly difficult time of year for people facing substance use challenges. Join our chat. On Thursday, December 21, we’ll be hosting a #BeTheDifference Twitter chat on tips and tricks for self-care and wellness during the holiday season. To join and share your tips, follow @MHFirstAidUSA on Twitter and use the hashtag #BeTheDifference in your responses. Share this infographic. 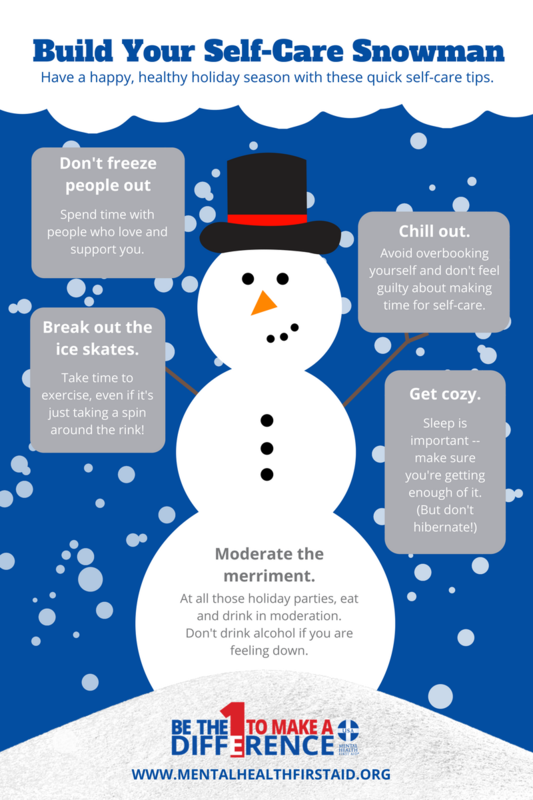 Post this festive infographic on your social media channels and share it with your networks via email to promote self-care this month. Share your best holiday self-care tips! We want to feature advice from our community on the #BeTheDifference blog this month. Send your favorite holiday self-care tip to DaniP@TheNationalCouncil.org by December 10 for a chance to be featured on the blog. Together, let’s help more people have a joyous holiday season.